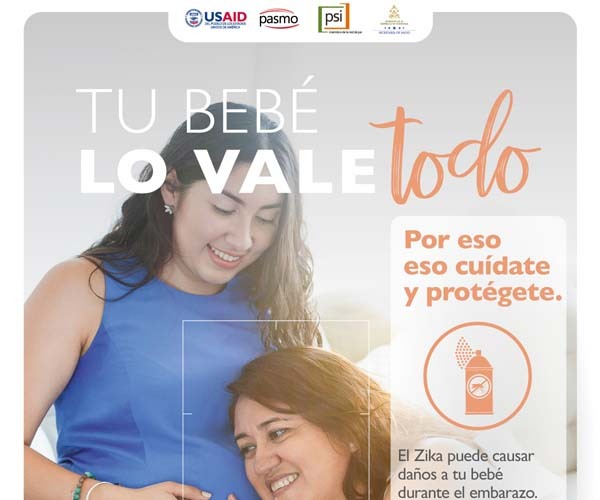 A poster prepared by the Honduran community that promotes family planning in the context of Zika. The chart is part of the 2nd Phase (2018-'19) of the regional campaign "Mama Segura, Bebe Segura del Zika" produced by PSI / PASMO with support from USAID. Endorsed by the Ministry of Health of Honduras. Size: 11 "x 17"
A poster prepared by the Honduran community that promotes the use of the male condom in the context of Zika. The chart is part of the 2nd Phase (2018-'19) of the regional campaign "Mama Segura, Bebe Segura del Zika" produced by PSI / PASMO with support from USAID. Endorsed by the Ministry of Health of Honduras. Size: 11 "x 17"
A poster prepared by the Honduran community that promotes the use of repellent in the Zika context. The chart is part of the 2nd Phase (2018-'19) of the regional campaign "Mama Segura, Bebe Segura del Zika" produced by PSI / PASMO with support from USAID. Endorsed by the Ministry of Health of Honduras. Size: 11 "x 17"
A poster prepared by the Honduran community to promote the elimination of mosquito breeding sites to reduce their exposure to Dengue, Chikungunya and Zika. The chart is part of the 2nd Phase (2018-'19) of the regional campaign "Mama Segura, Bebe Segura del Zika" produced by PSI / PASMO with support from USAID. Endorsed by the Ministry of Health of Honduras. Size: 11 "x 17"